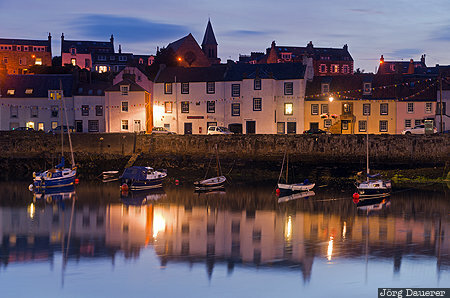 The houses of St Monans (or St Monance) and some boats illuminated by street lamp at the blue hour and their perfect reflexion in the calm water of the harbor. St Monans is in Fife in the south east of Scotland in the north of the United Kingdom. This photo was taken in the evening of a sunny day in July of 2013. This photo was taken with a digital camera.